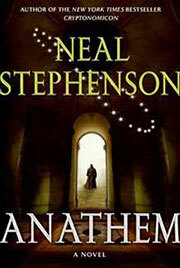 Neal Stephenson’s new novel, ANATHEM, germinated in 01999 when Danny Hillis asked him and several other contributors to sketch out their ideas of what the Millennium Clock might look like. Stephenson tossed off a quick sketch and promptly forgot about it. Five years later however, when he was between projects, the idea came back to him, and he began to explore the possibility of building a novel around it. ANATHEM is the result, and will be released on September 9th, 02008. The Long Now Foundation will be hosting the book launch event in San Francisco on the evening of September 9th. The evening will include a reading by Stephenson, Q&A with Danny Hillis, and a small concert of the original music inspired by the book. Signed copies of the book will also be available. Members of The Long Now Foundation will get complimentary priority invitations, and if you want to sign up for updates on this event please do so here. Still wondering what The Long Now Foundation is? You can find out more here.